Since this blog is about food, I rarely get to talk about other things I like. But today’s Vegan MoFo promt is the perfect occasion to change that. I like books and films a lot and I like it even more when films are about books and writers. The Grand Budapest Hotel is a film about writers. Sort of. It’s also a film about the author Stefan Zweig, whose works have inspired Anderson’s movie. (Also sort of. If you haven’t seen this movie, go watch it, it’s hard to describe. I promise it’s going to be fun!) In addition the director credits several old films, like Grand Hotel. Grand Hotel by the way is based on the fabulous Novel Menschen im Hotel (Grand Hotel) by Vicky Baum. There are other novels that could act as the model for this movie, like Hotel Savoy by Joseph Roth. For example, there’s a bakery in this movie called Mendl’s. In German this would be Mendl or Mendls Bäckerei. No apostrophe, I would say. At least not back at that time. Then again I might be wrong. I am siding with Konrad Duden here, who published Germany’s most influential dictionary. Thomas Mann on the other hand used apostrophes with genitive cases. So we’re probably lucky he wrote great novels instead of designing and printiong bakery signs. 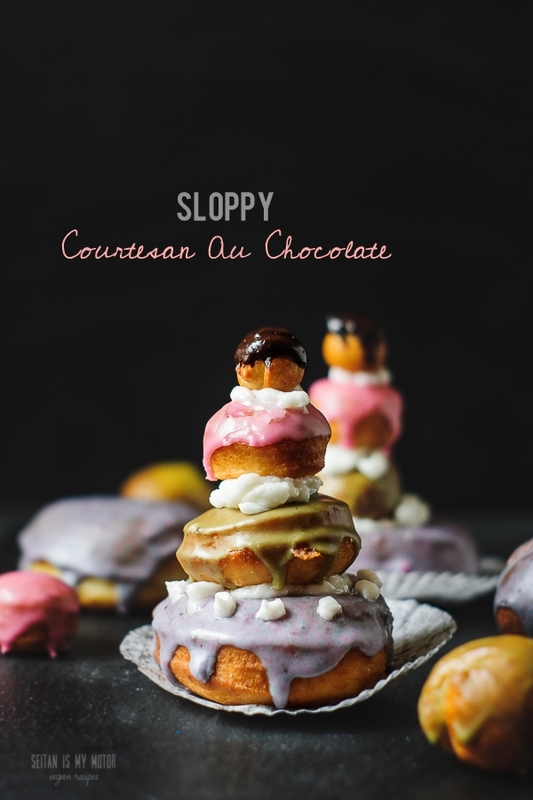 Anyway, Mendl’s supplies everyone with a pastry called courtesan au chocolate, which is again a mix of English and French words. Those courtesans au chocolate are a colourful and elaborate version of the French pastry Religieuse. For the movie this version was invented in a bakery in Görlitz and the recipe is online. The funny thing is that they used a dairy shop in Dresden, Pfunds Molkerei, as setting for the pastry shop. I’ve only been there once in my pre-vegan days, not to buy cheese, just because it’s an outstanding location and a tourist magnet. I only lasted ten seconds though because it was smelly as hell in there. So I cannot really imagine it turned into a bakery, even if it’s only for a few scenes. Those poor actors. Beautiful pastries smelling like aged cheese. 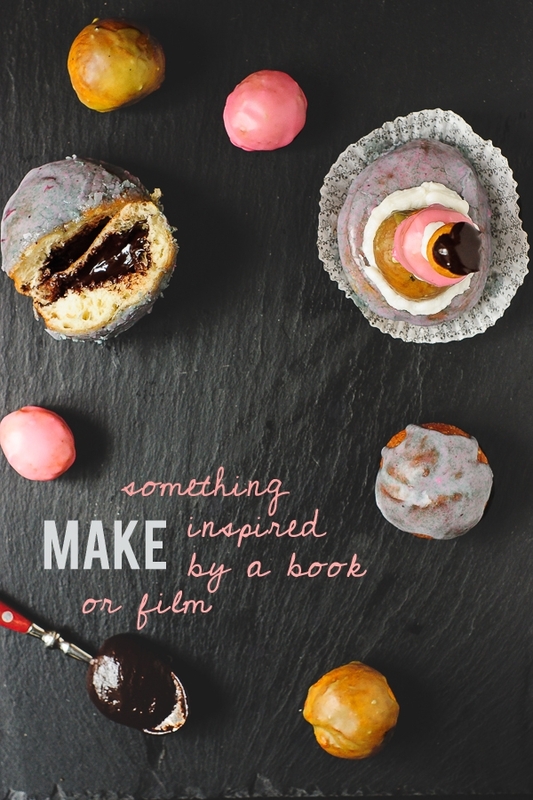 Whatever, let’s finally get to today’s topic: “Make something inspired by a book or film.” I did not only veganise the original recipe, I changed the whole thing. Because my recipe is how I has imagined the courtesans before learning about the recipe. It’s my version of the story! Note: For the food colouring I tried to go with natural dyes, but I think artificial ones would have been better. My colours came with a taste and I didn’t like both the matcha and the blueberry plus soda versions that much. So if you have access to artificial vegan food dyes, I recommend to use them. P.S. We’re on the last day of our vacation and I am writing this recipe on the road. The recipe plugin isn’t working that great on our tablet. Sorry if the ingredient list looks a bit confusing. I’ll fix that as soon as we’re home. To make the doughnuts, combine flour and yeast in a bowl. Add milk, sugar, oil, and salt to a small pan and heat until luke warm. Add to the flour mixture and knead for about 7-10 minutes, or until your dough is firm and doesn't stick. Cover the dough and let it rest until doubled in size, about 60-90 minutes. Roll the dough into 4 equally sized pieces and use differently sized cookie cutters to cut each piece into 3 differently sized disks. Note: This is what I did. It's easier just to roll each piece of dough into 3 differently sized balls. Use leftovers to make 4 additional small balls, about the size of a grape. Let the disks or balls rest (covered) until doubled in size. Heat the oil in a pot. If you choose a smaller pot, you'll need less oil. Just make sure that the doughnuts will be able to float and not stick to either the bottom of the pot or to each other. Use a candy thermometer. The oil should be around 160°C to 175°C, and definitly not hotter than 180°C. Fry the doughnuts for 1 or 2 minutes, or until crispy and browned. Transfer to some pieces of kitchen paper towels to drain off excess oil. To prepare the ganache, mix sugar and cornstarch and set aside. Place soy milk and chopped chocolate in a small pot. Heat carefully until the chocolate has melted. Make sure the chocolate doesn't burn and stir. Remove from heat and add sugar mixture. Whisk until silky. To fill the doughnuts, use a pastry bag with a long and small pastry tip. Use the tip to poke a hole into the big and medium sized doughnuts and then pipe some of the ganache into them. This takes a little experience but after a couple of doughnuts you should get the hang of it. To make the red glaze combine 50 g (1/2 cup) of powdered sugar with red food colouring and 1-3 teaspoons of water, depending on the amount of food colouring you used. The glaze should be silky and not too runny. Dip the small doughnuts into the glaze and let them dry on a cookie rack. To make the green glaze, combine 50 g (1/2 cup) of powdered sugar with matcha powder and lemon juice. Dip the medium sized doughnuts into the glaze and let dry. To make the purple glaze, combine 50 g (1/2 cup) of powdered sugar with baking soda and blueberry juice. Dip the large doughnuts into the glaze and let dry. The glaze will change its colour after a while and turn purple/blue purple. Dip the grape sized dough balls into leftover ganache and let dry. To make the frosting, place coconut oil and powdered sugar in a small food processor. Whip until smooth, add vanilla and whip again. To assemble, piple some frosting onto the large doughnuts and top with a medium sized one. Top the medium sized doughnuts with frosting and add a small one. Place the grape sized dough ball on top. Now try to eat this! This is ridiculous!! I can’t imagine having the patience to make these but I’d very happily eat them. I also loved hearing about the locations used in the movie, I don’t think I’ll be able to watch the bakery scene without thinking about the cheese now! I love film, so it was really nice reading such a detailed post! Right after I had posted I realised that I was talking complete nonsnse about locations! It’s probably just because I know what’s behind that museum and that the pastry shop is a dairy. I also love how Wes Anderson directs the movie to make us aware of so many things! I usually watch his films several times and still there are so many allusions, hints, and other tiny things I don’t get. I can’t stop looking at these, they are so pretty! 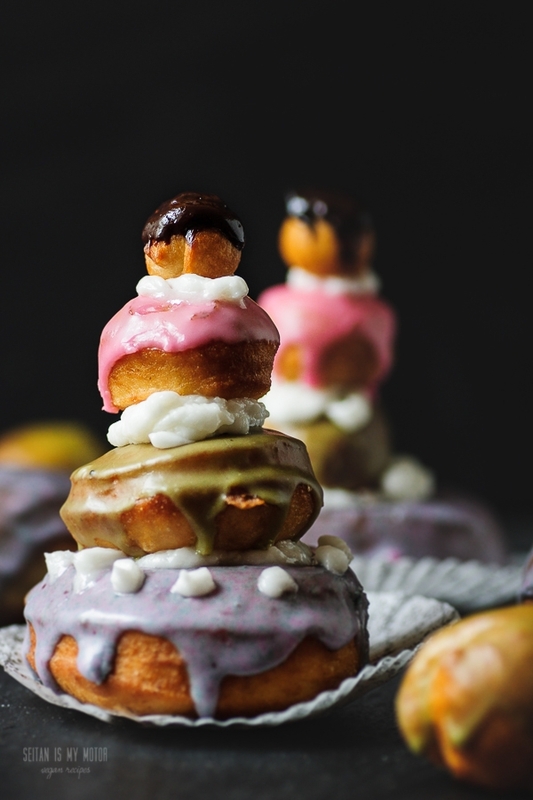 That doughnut tower is magnificent. I love that movie! I also love The Darjeeling Limited. I don’t see lots of movies, but I love Wes Anderson’s weird movies, and The Grand Budapest Hotel is probably my favorite one of all. I can’t even believe that you tackled this amazing project — and that they are so beautiful!! Was it super, super fun to eat them?? Did you feel like a magical fancy pants? OMG, this is amazing. I love Wes Anderson and the Grand Budapest and have often thought someone should veganize the Courtesans au Chocolat. Well done!! The pastries look incredible, C! I love the colors too. Not to mention they also have the advantage of not smelling like aged cheese. These are the most adorable things I’ve ever seen. You’ve convinced me that I need to see this movie too! They look extraordinary! You must be so impressed with how they turned out. I’m a huge Wes Anderson fan. I didn’t know where Grand Budapest Hotel was filmed, but I’ve quickly scoped out Goerlitz and it looks very pretty indeed. Maybe I’ll try to plan a visit! It would definitely be worth a day trip! And from there you can easily get to Dresden or do Poland.